Ring News 24Boxing News Breaking Boxing NewsDemetrius Andrade Dominates Kautondokwa to win WBO middleweight title but where does he rank at 160? Demetrius Andrade Dominates Kautondokwa to win WBO middleweight title but where does he rank at 160? 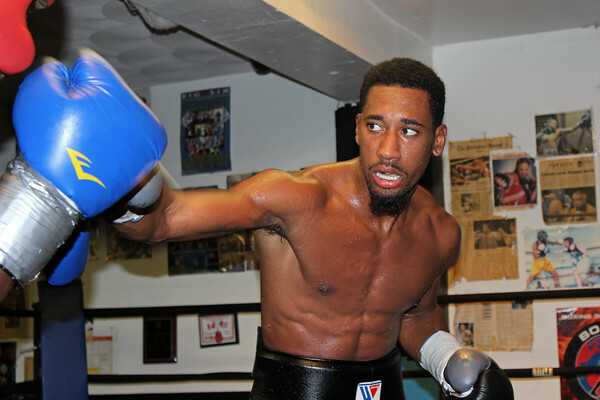 Demetrius Andrade shredded the label of “former champion” tonight in Boston, MA by dominating a very game Walter Kautondokwa to capture the vacant WBO middleweight title. The fight was the main event of a DAZN showcase, the second within the past three weeks presented by the streaming service. Andrade (26-0, 16 KO’s) was originally scheduled to face Billy Joe Saunders on this day but after that match was can celled, due to Saunders testing positive for the banned substance oxilofrine, and late replacement Walter Kautondokwa from Namibia took the challenge. Andrade had no real problems with his hard-punching foe, however, and looked like he was about to take him out very early. Andrade scored knockdowns in the first, although a replay showed it wasn’t a clear knockdown, as well as in rounds three and four. The story of the fight was that Andrade was far more talented and dynamic than his tough opponent, who continued to keep coming in a straight line despite getting tagged all night long. The pair exchanged more punches, with Andrade scoring yet another knockdown before the round was over. After that, we saw Andrade shift into a different gear, as he put his boxing skills on display. After 12 rounds the scores read 120-104 twice and 119-105 for an easy unanimous decision victory. This was a win that was very much expected, and honestly not nearly as fulfilling had Andrade found a way to beat Saunders in the ring. It’s hard to believe but the last time we saw Saunders in the ring was nearly a year ago when he out hustled and outclassed David Lemieux over 12 easy rounds. Andrade is very good but where does he stand at 160 pounds? He’s not the biggest puncher of the division but he is one of the most talented, no question. An eventual fight with Saunders would make for a great encounter, regardless of everyone’s opinion of the UK star who has been chastised a bit in the press. And let’s not forget the winner of this Saturday’s fight for the vacant IBF middleweight title between Danny Jacobs, former WBA middleweight champion, and Sergiy Derevyanchenko, a power-punching, undefeated contender. The two biggest names in the division are that of Canelo Alvarez, who recently inked an exclusive 11-fight, $365 million deal, as well as former lineal middleweight champion Gennady Golovkin, who suffered his only loss this past month to Alvarez in a classic battle. Golovkin, a free agent, is said to be weighing all options from networks such as DAZN, Showtime, and ESPN. And there is also the dark-horse Rob Brant, who upset former champion Ryota Murata tonight in Las Vegas to capture the WBA middleweight title. Given his affiliation to DAZN, as Andrade is promoted by Matchroom’s Eddie Hearn, the Canelo fight may be the easiest one to make, but who knows how the wheels will turn. Either way, Andrade is an intriguing champion at 160 pounds who deserves bigger fights.